RAIL Back On Track (http://backontrack.org) a web based community support group for rail and public transport and an advocate for public transport passengers has said it is now time to move to sort out public transport in Brisbane and SEQ. "The overall strategy for sorting out public transport in SEQ and Brisbane is simple." "First: Steps must now be taken to sort out the Brisbane bus network. Turn Victoria Bridge into a green bridge, fix up the Cultural Centre Bus station, start reforming the bus network so that the number of near empty buses in the CBD can be reduced and buses deployed to the suburbs where they can actually service our community. Roll out frequent feeder buses to key bus and rail stations." "Second: Fare review, time this was completed. Continuing to delay this essential reform is not acceptable." "Third: Advance Cross River Rail - this will enable the needed capacity on the rail network in SEQ, and importantly also deliver significant mass transit capacity into and out of Brisbane CBD. Cross River Rail is equivalent to a 30 lane highway in terms of increased passenger mobility." 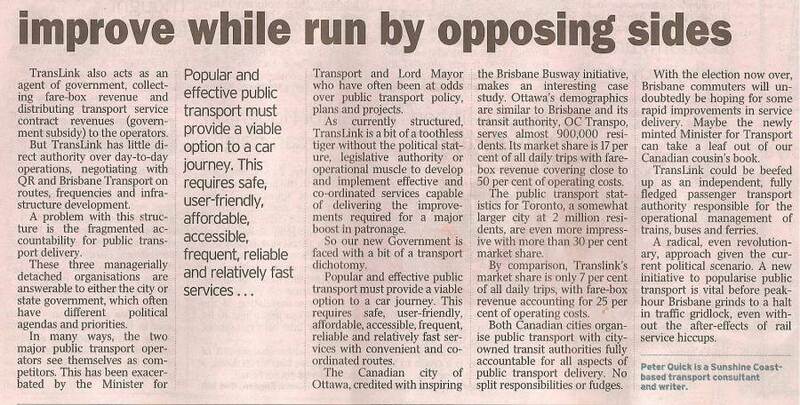 "The recent Brisbane Council election highlighted the idiocy of public transport policy in Brisbane . It is clear what needs to occur from here." There is no doubt the recent BCC Election Campaign dispelled any doubt as to why BCC needs to be stripped of public transport planning. TransLink needs to be properly staffed and given the actual, not pretend authority, to get on with fixing up public transport for SEQ. TransLink was ' gutted ' by the Newman administration. Time to fix that as well. 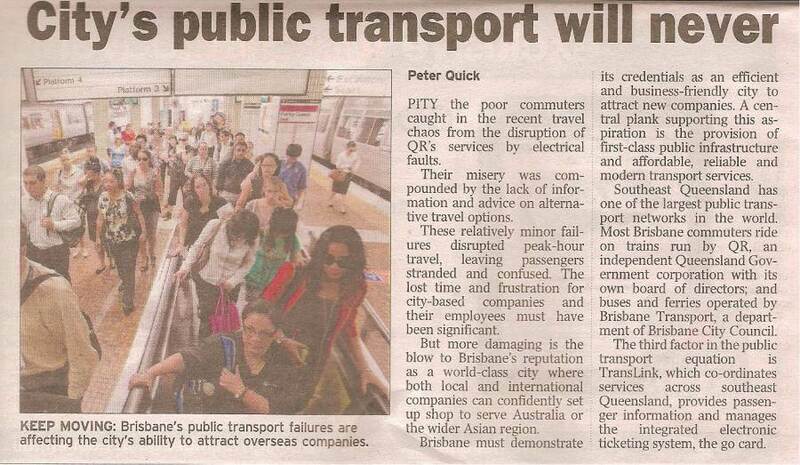 Lets get moving with delivering a proper public transport network for all of SEQ, including Brisbane. Dysfunction seen in the public transport policy sphere comes down to Brisbane City Council and the Queensland Government being at cross-purposes. This has run for years. It's why the bus network goes unreformed, why bus service back holes exist in Brisbane's suburbs, why fare structure is broken and unaffordable for many, and why we have Cross River Rail competing against Lord Mayor Graham Quirk's 'Quack' Metro. We have shown the way. Premier Annastacia Palaszczuk should strip all public transport functions from Brisbane City Council using legislation to alter The City of Brisbane Act (2010). Peter Quick again highlights the quagmire that is transport planning in Brisbane in today's Courier Mail. It simply is not working. Pie in the sky proposals such as the ' Quirk Metro ' when basic bus network reform will deliver the same benefits for near neutral cost is just a testament to the failure. Cross River Rail is actually needed, enables the entire rail network for SEQ and brings profound mass transit benefits to Brisbane as well. DEEP in the bowels of Parliament House there may be a training school for new and aspirant ministers. This “School for Spin” would be staffed by grizzled ex-premiers and ministers who have been there, done that in administrations long forgotten. They teach the new bunch the dark arts of political communications; how to talk the talk without walking the walk, and dress up old, worn-out policies in new clothes to look like sparkly, fresh new ideas. The passing out test is to stand by a colourful map of Brisbane crisscrossed by squiggly lines and pretty pictures of hi-tech trains and flashy stations. They must sound convincing, spruiking the latest regurgitation of tunnels, light rails, metros or some other glitzy transport project as a new innovative concept which will cure our looming traffic and public transport congestion problems at a stroke. So I watched with some cynicism as Deputy Premier Jackie Trad and Minister for Transport Stirling Hinchliffe stood in front of a map of yet another Cross River Rail proposal. Then they said that such was the importance of the project it would be handled by a new statutory authority. I was gobsmacked! We already have three separate government entities involved in public transport planning and delivery – Queensland Rail, TransLink and Brisbane City Council. And they propose a fourth to deliver an extension to the existing rail network. Yet another board of corporate worthies with attendant bureaucrats and admin staff housed in palatial offices in George St.
Their explanation is that “international experience demonstrates that delivery authorities support wider economic and social outcomes and enable federal, state and local government to co-invest and partner with private sector for funding, financing and delivery”. Have the federal government and Brisbane City Council agreed to invest in the project? No business case has been put so it’s difficult to believe they would have committed millions of dollars to a couple of lines on a map. At around $5 billion the project is relatively small beer by international standards. For example, CrossRail in London is estimated to come in at some $30 billion, from whence, I suspect, this idea has sprung. Infrastructure projects of similar scale and cost have been executed without setting up new project delivery entities – take the Airport Link, Clem 7 and Legacy Way tunnels with a combined cost of some $10 billion, not to mention a busway network successfully delivered over the last 20 years. At around $5 billion the project is relatively small beer by international standards. Let’s consider some alternatives. Queensland Rail has been building railways for years. Could we not beef up the board and management with some property expertise and tweak their charter to include land development opportunities? Or to possibly invite private sector consortia to submit expressions of interest to finance, build, own and lease back the tunnel and exploit associated land development opportunities? Surely an alternative can be found to a brand new quango which, in my view, would just exacerbate the already fractious turf wars between our current public transport bodies. The Premier has said that 2016 will be a year of delivery? How about delivering bus network reform? Bus network changes are frozen. Western region and Gold Coast buses need improvements. Children have been left behind at bus stops around Goodna, hardly satisfactory is it? Constant late and no show bus services are making it very difficult for people to use and rely on public transport. Brisbane Transport cannot even meet the minimum on time standards. Do the authorities care? Apparently not, they just let the mediocrity roll on. TransLink has a new DDG - has anyone heard from him? The Queensland Government seems to be replaying the worse years of the Bligh Government. Rapidly losing touch with their core constituency by failing to deliver basic services that matter directly to punters! 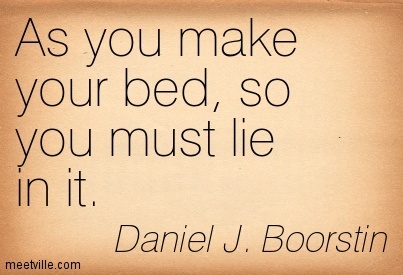 You make your bed, you lie in it! History repeating ..
OUR four children and another year 8 boy attending Glenala SHS catch the 524 (Translink) bus from Gorry St, Goodna (7:09am) to Goodna Train Station to meet school bus 32 (travels to Inala SS and Glenala SHS). The reverse route occurs in the afternoon. The other day, a Year 8 boy (not one of ours) was left stranded at St Ives shopping centre (around 4:30pm), because the bus driver told him that the bus was full. I drove down to St Ives, once our children informed us, to check on the other child's welfare. This morning our four children were not let on the bus, because the driver claimed that the bus was too full. The bus driver was the same lady in both cases. We are concerned that an incident similar to the Daniel Morcombe incident could potentially occur in our area. We were able to drive our children to the station this morning, but if this occurred with other children, whose parents are unable to take them to Goodna station; there are no other times that a school bus leaves Goodna Station for Inala. After this morning's incident, my partner contacted Translink and made a formal complaint. We are waiting for a response. Is this occurring on other bus routes? Are buses needed more frequently at peak times? Are there regulations regarding the age of the child that may be left behind? "First: Steps must now be taken to sort out the failing Brisbane bus network. Turn Victoria Bridge into a green bridge, fix up the Cultural Centre Bus station, start reforming the bus network so that the number of near empty buses in the CBD can be reduced and buses deployed to the suburbs where they can actually service our community. Roll out frequent feeder buses to key bus and rail stations and introduce new cross-suburban routes." "Third: Advance Cross River Rail - this will enable the needed long term capacity on the rail network in SEQ, and importantly also deliver significant mass transit capacity into and out of Brisbane CBD. Cross River Rail is equivalent to a 30 lane highway in terms of increased passenger mobility." "The Brisbane Council election highlighted the idiocy of public transport policy in Brisbane . It is clear what needs to occur from here." "It is time to deliver!"